Previously on Impact: Last week on Impact, The Hardys batted Decay in an epic spectacle, Delete or Decay. It ended with Abyss and Crazy Steve abducting Senor Benjamin. Additionally, Billy Corgan retired the King of the Mountain championship, and introduced the Grand Championship. A tournament to crown a the first Grand Champion began last week. Tonight on Impact: The Grand Championship tournament continues when the debuting Aron Rex takes on Trevor Lee, and Eddie Edwards faces Mahabali Shera. Also, Rockstar Spud will battle Braxton Sutter in an Exposed Turnbuckle Empty Arena Match. 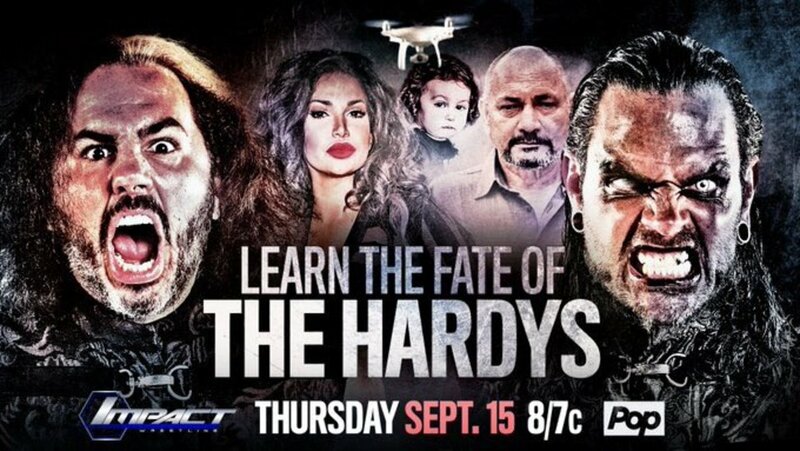 Plus, we findout the fate of The Hardys following Delete or Decay. - Impact starts with Broken Matt in the woods recapping Delete or Decay and the destruction to House Hardy. Matt conducted a regeneration ceremony by pushing an injured Jeff into the water. Jeff came out wearing a purple shirt and matching tie. He said the champ is back and you can’t see me. He lit a cigarette before being pushed back in and came back a regenerated Jeff, Nefarious Brother Nero. Matt then set off to find Vanguard 1. - In the Impact Zone, Jeremy Borash brings out TNA World Heavyweight Champion Bobby Lashley. Lashley bragged about injuring Ethan Carter III last week. Grado came to the ring and called Lashley a coward for attacking EC3. Lashley jumped him and gave him a spear. Lashley took the mic and said nobody in TNA can beat him. This brings out Moose. Moose and Lashley brawl with Moose getting the better of Lashley. Moose challenged Lashley to a match later. - Next we get a recap of the rules for the Grand Championship. Each match consists of three 3-minute rounds, and they can end by pinfall or submission. Each match will also have judges using a 10-point scoring system. If the match ends in a draw, it goes to the judges for a decision. -In the back, Lashley turned down Moose’s challenge for a match later. Josh Mathews informs us that the judges are scoring on aggressiveness, controlling the match, and physicality. Rex wins the first round when two judges scored in his favor. Rex wins the match in the second round by pinfall to advance in the tournament. - In the back, J.B. introduced Knockouts Champion and Leader of the Knockouts Maria Kanellis. Maria announced Gail Kim’s Hall of Fame induction will take place next and not at Bound For Glory. - Backstage, the unseen interview guy asked Aron Rex a series of questions but all of his answers were "Drew". - Matt found Vanguard 1 offline and stuck in a tree. Matt held Vanguard 1 in his arms and cried. He prayed to the Seven Deities. Vanguard 1 comes online and has flashbacks of all the good times he had with Senor Benjamin. Vanguard 1 flew away in search of Benjamin. - Maria and Allie are in the ring. The crowd chanted for Allie, so Maria called her stupid and dumb. Gail comes to the ring and Maria showed a Hall of Fame video package of Maria beating up Gail. Maria gave Gail a picture of herself as a present instead of a stupid watch. Allie had a present for her hero Gail, but Maria destroyed it. This brings out Dixie. Dixie reminded Maria that it’s a conflict of interest to be the Knockouts Champion and the leader. Dixie announced that Gail will be in the Gauntlet match later for a shot at the Knockouts title at Bound For Glory. They fought all over the empty Impact Zone before finally getting in the ring. The finish of the match came when Sutter sent Spud mouth first into the exposed turnbuckle and scored the pin. Spud bled from the mouth. - Vanguard 1 finds Senor Benjamin in a shed and brings Matt to release him. Matt told Benjamin to prepare the weapons and House Hardy for Bound For Glory because a great war is coming. - Backstage, Moose wonders if Lashley is going to accept his challenge or run off. - Broken Matt, Jeff, and Reby are in the ring. They recap Delete or Decay and promise to permanently delete Decay. This brings out Decay. Rosemary mentions that Maxel belongs with them. She also brought up that they destroyed Bram. Matt challenged Decay to a match at Bound For Glory he called The Great War. The crowd chanted “War”. Decay got in the ring and Rosemary called Reby an unfit mother. The Hardys and Decay brawled with the Hardy clearing the ring. - In the back, Mike Bennett tried to convince Lashley to take the match with Moose but Lashley refused. Order of entry: Jade, Laurel Van Ness, Sienna, Gail Kim, Marti Bell, Raquel and Madison Rayne. Allie was actually the second entrant, but Maria prevented her from entering. She replaced Allie with the debuting Laurel Van Ness. The final four was Sienna, Laurel, Gail and Raquel. Sienna dumped Raquel on the outside. Maria ordered Allie to interfere but it backfired and Laurel ended up eliminated. It came down to a one-on-one match between Sienna and Gail. Finish of the match came when Sienna went for the Silencer but Gail countered with Eat Defeat for the victory. The judges give the first round to Edwards with a 10-9 score. Shera wins the second round on spilt decision. Edwards won the match in the third round with a submission victory to advance to the semi finals. - Moose came out to fight Lashley. Lashley said that instead of fighting tonight, they should fight at Bound For Glory for the big payday. Moose agreed but can’t wait for BFG and attacked Lashley. They brawled around ringside. Moose set up for the Go To Hell but the Bennett ran out and attacked Moose. This gave Lashley the chance to spear Moose. Bennett and Lashley double teamed Moose. This brings out EC3 with his ribs taped up. EC3 ran wild on both Bennett and Lashley. Show ended with Moose and Bennett fighting on one side of the ring and EC3 and Lashley brawling on the other side. Next Week: The build up for TNA’s biggest event of the year, Bound For Glory, continues next week!